The catalog of Pink Stallone & Joey Washington singles continues with the arguable gem of their collaborative sessions, Mine. The second Daniele B & Eddie Mars co-production, Mine exhibits the steady progression of the Stallone sludge-funk thump, again fueled by gushing maturity and composure from Washington vocals. 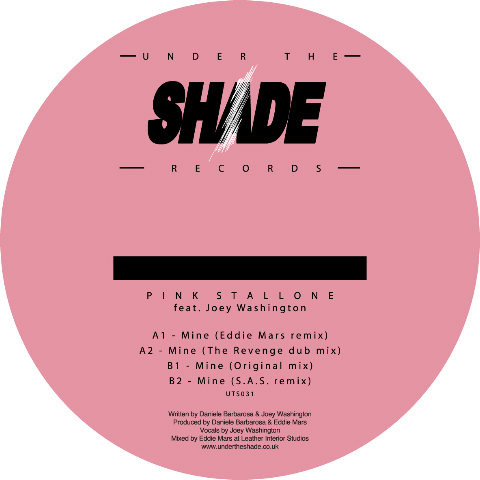 Eddie Mars even delivers his own stunningly-authentic production of the Stallone/Washington sound, marking the first official Mars rendition of Pink Stallone since his inception as a producer and member of the live group. With this comes two workouts by master of the deep The Revenge who provides a stripped back timeless dub. One of those tracks that will still sound great in twenty years time. Simple and effective with a hint of grandeur. Finally wrapping things up are S.A.S (Subb-an & Adam Shelton). Following the bumping Foot & Mouth release earlier this summer we had to ask the boys to give there twist and they sure delivered. Acid base and full throttle beats transform 'Mine' into a jacking dancefloor destroyer, be warned!